I knew Judy Goldman only by reputation when I enrolled in her writing workshop at Charlotte Center for the Literary Arts in 2015. The 77-year-old is a Charlotte writer with a national following. I’ve since taken other courses from her and love her enthusiasm for teaching as much as I love her clear, thoughtful language. Goldman has written two novels (Early Leaving and The Slow Way Back), a memoir (Losing My Sister), and two books of poetry. And her latest book, Together: A Memoir of a Marriage and a Medical Mishap (Nan A. Talese/Doubleday, $25), recounts a heartbreaking chain of events. In an effort to relieve back pain, Goldman’s husband, Henry, underwent a routine outpatient procedure that left him paralyzed from the waist down. And none of the doctors they consulted could explain why. 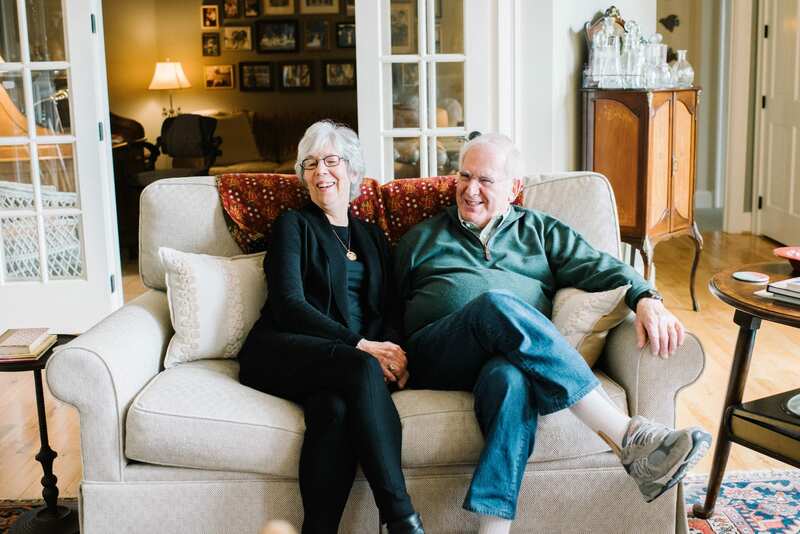 The Goldmans have lived in Charlotte since they married in 1967, and the city is the setting for most of the book, available Feb. 12. I met my teacher for coffee near her Eastover home to discuss Together and the real-life story that led to the memoir. Here are excerpts from that conversation. I’ve never met Henry, but after reading Together, I love him. Isn’t he adorable? Everyone loves Henry. Was it cathartic to write something so personal? How does Henry feel about it? The reward for writing memoir is self-understanding, and that’s better than catharsis. You’re discovering the deepest parts of your personality. And Henry is the star of this book. He’s so accustomed to me writing about him. It was part of our marriage contract. When he read the first draft—and he’s always my first reader—I saw him crying. It was very emotional. The craft in this book is beautiful. One chapter is about the history of your marriage, and the next is about what happened to Henry and your family. At first, my agent wanted me to tamp down the medical and ramp up the marriage. I was thrilled because I didn’t want to sound like that person who sits beside you on an airplane and tells you all about their gallbladder surgery. But then, after that rewrite, Nan Talese, my editor, said to ramp up the medical and tamp down the marriage. Two opposite opinions, and both were right. We got engaged on our third date. And we are so not impulsive. We’ve been trying to decide whether to repaint our living room for four years. We’d never even had an argument before we married. I started writing an essay about the hold-up, which happens about two-thirds of the way into the book, in 2008. Yes, you were held up at gunpoint at the dry cleaner. Did you publish that essay? No. I realized the story I really needed to tell was the story I said I was never going to write. And that was about Henry’s accident. But the holdup was pivotal. It was. It happened two years after the accident, and it was the first time I really cried about what happened to Henry. It was the beginning of my accepting that you can be dropping off clothes at the dry cleaners, and all of a sudden, a gun is aimed at your stomach. You can be having a routine medical procedure, and all of a sudden, you’re paralyzed from the waist down. Everything is fine, and then nothing is fine. Together should be required reading for people in the medical field. So many people dismissed you along the way. You were in a rehab facility for six hours before anyone greeted you. There were heroes who saved my husband with their kindness and their wisdom. And there were those really rough experiences that we’re all having now with medicine the way it is today. Accidents happen. The story of the book is the epidural, where everything went wrong. And yet, that doctor only wanted to help my husband. We all shared the same goal of wanting to help my husband. Some of us were more successful than others. And I made mistakes along the way. My biggest mistake was what I felt inside—that something awful had just happened and something awful was getting ready to happen. When I was in that frame of mind, I was not effective. In fact, I could be rude, insensitive. And that’s what I had to face as I worked on this book. The rule in memoir is that you have to be twice as hard on yourself as you are on everybody else. In early drafts, I was perfect. I was a saint. (Laughs.) Maybe that’s why it took me so long to write. You’re being too hard on yourself. Sometimes you were polite to a fault. Sometimes I was. That can be a Southerner’s way of manipulating people, and it’s not OK.
There’s a funny bit about you telling Henry what kind of woman he should marry if you predeceased him. Had you ever discussed one of you becoming disabled? Do we ever practice facing the unheard of? There’s no dress rehearsal for that. And that’s sort of the point of my book, I think. It’s a story about the life we dream of and the life we make. Marriage has a way of taking you into territory you’ve never been before. Each stage is a new world. I think my job in the marriage thread was to show the different versions of my marriage. And what was your job in the medical thread? To forgive. To forgive the doctor. To forgive Henry for deciding to have the procedure. To forgive myself because I can’t keep everyone safe. I needed to forgive everybody because we’re all just human. Did you set out to forgive? Is that part of why you wrote the book? It was something I’d hoped would happen. I wasn’t sure it would. You write that, like Patty Hearst, you married your bodyguard. You thought you were being looked after, but all through the book, I see you as brave. Have you come to see yourself that way? I was strong all along, and I came to understand that. Maybe we’re all a little bit strong and a little bit fragile. Sometimes I do, and sometimes I don’t. I believe we look for lessons in what happens. We want to attach meaning to random incidents. Randomness scares us. Even though we know we can’t control anything, we can try to understand it. Judy Goldman will discuss and read excerpts from her new memoir, Together, at these local spots. Saturday, March 16, 4 p.m.
Saturday, April 27, 2-3:30 p.m.
Charlotte-Mecklenburg Public Library | Morrison Regional, 7015 Morrison Blvd.